An investigation by Salem Reporter established the Salem-Keizer Education Foundation grew rapidly, taking on services to children at a pace that left little room for unexpected expenses, and took on substantial debt to open a new building. The volunteer board is reviewing all programs as it trims expenses. A year ago, education leaders and volunteers gathered for a ribbon cutting ceremony to open the new home of the Salem-Keizer Education Foundation. The historic Starkey-McCully Building downtown was triple the space the nonprofit had worked in before, matching growing needs to serve local children. But the celebration that Thursday in January 2018 masked a deepening financial crisis within the foundation that continues to this day. On the cloudy day of that grand opening, the foundation was already late repaying a temporary loan needed to pay contractors on the $1.7 million project and an anticipated $250,000 grant from the state was still months away. To cover bills, the foundation soon stopped paying its executive director and later still had to borrow another $200,000 to stay afloat. The foundation shared none of that with the public, even when Krina Lee, its long-time executive director left in August 2018. This week, the strains of a foundation that serves 40,000 local children a year emerged publicly. 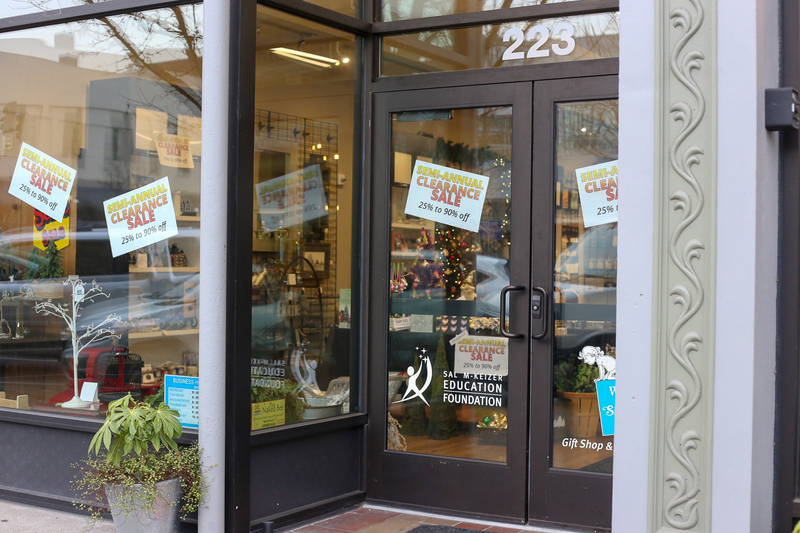 The foundation announced Tuesday that it was shuttering its gift shop, Where the Sidewalk Begins, by the end of March. In a statement, the foundation said it has “worked diligently on reducing its expenses” and the closure of the 9-year-old store was part of its assessment. An investigation by Salem Reporter established the foundation grew rapidly, taking on services to children at a pace that left little room for unexpected expenses. The new building added to the strain, and there are indications that Lee and her volunteer board of directors looked past each other as the troubles mounted. This story is based on a review of tax returns, county property and mortgage records, and interviews with current and former foundation officials. Foundation officials have been reluctant to discuss their plans in detail, other than to say they are focused on preserving before and after school programs. They released tax documents through mid-2017 and responded to questions about the financing of the building, but did not respond to a request to provide more recent financial statements. “We are working on multiple fronts to assure the sustainability of SKEF,” said written statements from Brent Neilsen, who stepped down as board president to serve as interim executive director. Jeff Aeschliman, a government affairs worker for State Farm, is the interim board president. The foundation was established in 1982 as an adjunct to the Salem-Keizer School District, raising money to support programs the district itself couldn’t afford or offer. Today, it touches nearly every school child in the region. According to its 2017 federal tax return, the foundation provided after school programs for 11,000 children and fed 64,000 meals. Krina Lee, long a fixture in local nonprofit organizations, took over as executive director in 2004 and in the following 14 years she presided over rapid growth. The foundation became well known for high-profile events such as the Awesome 3000 run and the Crystal Apple ceremony to honor local educators. By last year, the foundation was churning through $3 million a year, raised through grants, donations and profits from its events and services. Lee said the foundation had grants and donations to cover all program additions, but sometimes struggled with cash flow if payments from funders were late. In April 2014, the foundation bought the Starkey-McCully Building at 223 Commercial St. N.E., a former mercantile on the National Register of Historic Places. The plan was to remodel the 19th century building into the Mike McLaran Center for Student Success, an expanded office space with room for tutoring and other programs. Initial remodeling and demolition work was done in 2016 as the foundation set a $2.5 million fundraising goal to pay for the major overhaul. The campaign soon ran into trouble. An expected gift of $75,000 didn’t come through, Lee said. And plans to get state help in 2017 stalled. Jodi Hack, then a state legislator who also served on the foundation’s board, had taken the lead in going to House Speaker Tina Kotek that year to ask for $250,000 to help the project. But the funding didn’t pass, and Hack left the Legislature and the board later that year. Meantime, the foundation started on the major remodeling despite the funding gap. Lee said the foundation started the work to benefit from donations of material and labor from local contractors. Costs escalated, in part because the roof leaked. Waiting for the building to dry out caused construction delays, which meant more money, Lee said. “We had some surprises with the building,” Lee said. “The most significant challenges we faced were construction delays and streams of funding that were not fulfilled,” he said in his written statement. To cover the gap, Mountain West Investment Corp., a Salem development company, agreed in November 2017 to loan the foundation $900,000 for six weeks. Repayment came much later. “They were anticipating they were going to get monies from the state by that time and it just didn’t happen. It didn’t come until spring and so Mountain West agreed to forebear collecting on that,” said Mark Shipman, the attorney who worked on the loan for Mountain West. The company was paid back in full in April 2018, he said. Two weeks after the grand opening, Pioneer Trust Bank funded a $950,000 mortgage. Lee said a mortgage was always an expected part of funding the center, though the near million-dollar price tag was more than she’d anticipated having to borrow. Payments on the mortgage were lower than the rent the foundation had been paying on its former headquarters next door, Neilsen and Lee said. That figure was almost $100,000 a year, according to the foundation’s tax returns. Still, the mortgage wasn’t enough to cover the renovation costs, and the foundation continued to seek help from the state. In 2018, state Reps. Paul Evans and Teresa Alonso Leon resumed the effort to get $250,000 from the state, which the Legislature appropriated and routed through the state Education Department. Lee and Neilsen said the volunteer board was apprised of the financing challenges all along. But some board members said they didn’t have a clear picture of the project’s financing when construction began. Katie Costic, the board’s vice president for equity and access, said she knew some funding hadn’t come through, but generally thought the campaign was going well. “I was very unaware of our financial situation at the time,” Costic said. Financial pressures continued to mount through the spring. Moving into the new building came with unexpected expenses, including permitting costs and legal fees, Lee said. “It was not any one thing,” Lee said. In March, she stopped getting her $7,500 monthly fee from the foundation, she said. Neilsen said Lee chose to forgo her salary and the board did not make a decision to stop paying her. Lee said she asked the board’s finance committee, which had not been meeting regularly, to look at the foundation’s financial health. By summer, the board did appoint a subcommittee and “issues were identified,” Neilsen said. The circumstances only grew worse and the foundation needed yet more cash. In July, it opened a $200,000 line of credit to cover operating costs. The next month, Lee left, publicly lauded for her years of stewardship of the foundation. She said she’d offered to step down several times before, but board members told her no one else was willing to do the job for free. Lee said in announcing her departure that she wanted more time for her consulting business and with her parents. Her husband is Chuck Lee, a member of the Salem-Keizer School Board. Neilsen declined to say whether the board asked her to resign. Since Lee’s departure, Neilsen and the board have focused on a plan to keep the foundation financially viable while paying down the debt owed. Neilsen has been working with Ron Hays, executive director of United Way of the Mid-Willamette Valley, to review the organization’s finances and find a path to sustainability. Hays said the task is significant. The foundation has about $1.5 million in long-term debt, mostly on the building, and $300,000 in short-term debt. The foundation also has significant assets, including the new building, which Neilsen said was valued at $2.8 million. Those assets exceed liabilities, Hays said. Many of the foundation’s core programs are self-sustaining because of tuition, fees and grants, he said, and those programs are important to preserve. “I think the board is willing to roll up their sleeves and do the hard work," he said. The school district has been talking with the foundation about which programs and services to prioritize, said district spokeswoman Lillian Govus. Their goal is to “make sure the work SKEF is doing is in concert with what the district is doing” and supporting the strategic plan, she said. That may include reviewing smaller programs like the annual spelling bee to determine whether they’re critical to the district and foundation’s mission, she said. Board members said they’re working diligently to get the foundation back on solid footing. CORRECTION: This article originally described Jeff Aeschliman as an insurance lobbyist. Aeschliman works in government affairs but is not a registered lobbyist. DISCLOSURE: Larry Tokarski, the president of Mountain West Investment Corp., is a founder of Salem Reporter.